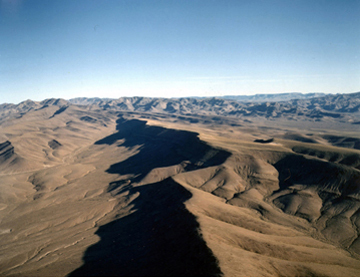 Nevada's Yucca Mountain is the proposed site of a national geological repository for nuclear waste. After 30 years and $9 billion worth of federal research, Yucca Mountain is one of the most intensely studied pieces of real estate in the world. But the Nevada landmark  the proposed site of a national geological repository for high-level nuclear waste  remains shrouded in controversy. In a new report, two experts admit that scientists cannot answer every question about the site's future security. Still, they say, it is time to move forward and build a carefully monitored facility. "The point we're making is that there will never be closure to all the questions about Yucca Mountain, or any other site" that could host an underground nuclear repository, says Isaac Winograd, an emeritus scientist of the U.S. Geological Survey (USGS). But that's no excuse for inaction, argue Winograd and Eugene Roseboom, also a USGS emeritus scientist, in a paper published today in Science. "We have to live with some unknowns," Winograd says. "The real question is whether it's safer to put this waste in one isolated, monitored site or to keep it spread among 121 sites throughout the country." The idea for a centralized nuclear waste repository dates back to a 1957 recommendation from the National Academy of Sciences. Since the beginning of the U.S nuclear program, waste from nuclear reactors and other projects has been stored in temporary facilities in 39 states. Moving it to a single, underground site would reduce the environmental, health and security risks of storage, the Academy said. Congress endorsed the strategy in the Nuclear Waste Policy Act of 1982, which authorized detailed studies of three potential storage sites. In a 1987 amendment, Congress settled on Yucca Mountain. Since then, the Department of Energy (DOE) has worked to design the facility. The original plan called for waste storage to begin in 1998. Ten years after that deadline, however, the project is still mired in debate. Citizens and policymakers from Nevada and across the nation have waged an ardent legal battle to prevent implementation. Winograd and Roseboom examine the reasons behind the opposition. For one, they note, the Yucca Mountain Project was born in political controversy. Congress passed the 1987 amendment before officials completed technical reviews of the three proposed sites, fueling distrust among Nevadans who now call it the "Screw Nevada Bill." But the other factors, they say, would apply to many proposed repository sites and thus should not continue to hamper the project. One sticking point is the public's belief that radioactive waste, once stored underground, cannot be accessed if new problems arise and the waste needs to be moved. That's simply false, the authors explain. In fact, one of Yucca Mountain's chief benefits is its openness to monitoring and possible future retrieval. The public's more general discomfort with radioactive waste storage, they argue, stems from a fear of nuclear radiation, wariness of experts and NIMBY ("Not In My Backyard") sentiments  not from technical questions about Yucca Mountain. One technical question does have some scientific basis  lingering unknowns about the facility's security and its future stability. Yet that's just the nature of scientific endeavors and pioneering projects, Winograd and Roseboom write: "The more we learn about a given subject, the more complex it becomes." Given the vast time scales involved  much of the radioactive waste has a half-life of thousands or millions of years  precise predictions are an especially tough business. The best way to limit that uncertainty, the authors say, is to build the repository in stages, initially as a pilot plan. "Each step of the process should provide feedback to the step that follows it," Winograd says. Bob Loux, director of the State of Nevada Agency for Nuclear Projects, says that's not enough to clear the controversy. In the minds of Nevadans, he says, uncertainty isn't the real issue. "The problem is with the site, not with the predictions." Loux offers a long-range forecast of his own. Most Nevadans, he says, will never support the Yucca Mountain Project  even if officials follow a closely monitored, multi-step plan. "There's no chance," he says. "There's such a distrust of the DOE and the NRC [Nuclear Regulatory Commission]. Nevadans believe the whole process is rigged." For now, the fate of Yucca Mountain remains uncertain. On June 3, DOE finally submitted its application for a license to build the full-scale repository at Yucca Mountain (a pilot project repository has been built) to the Nuclear Regulatory Commission, but the approval process will take three to four years. Says NRC spokesman David McIntyre, "It's definitely too early to say what will happen."